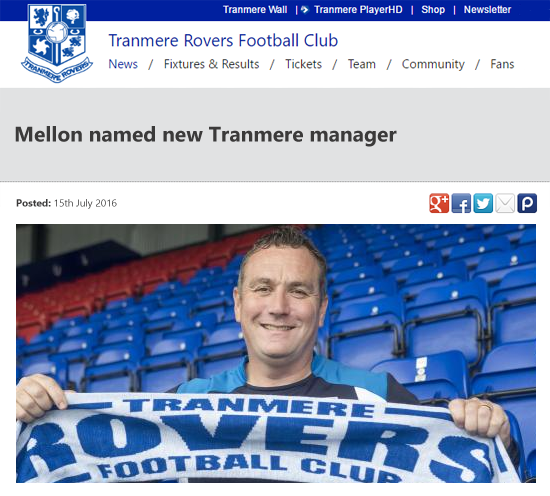 Tranmere Rovers - Who needs a lemon when you've got a Mellon! Former Tranmere Rovers player Micky Mellon has been appointed as the club's new manager after leaving League One Shrewsbury Town. As a player, midfielder Mellon had two spells at Prenton Park. Either side of a two-year stint with Burnley, he made 205 appearances and scored 10 goals for Rovers and was a popular figure amongst the Tranmere faithful. As a manager, the Scotsman has had a great deal of success since taking his first role back in September 2008 with Fleetwood Town. 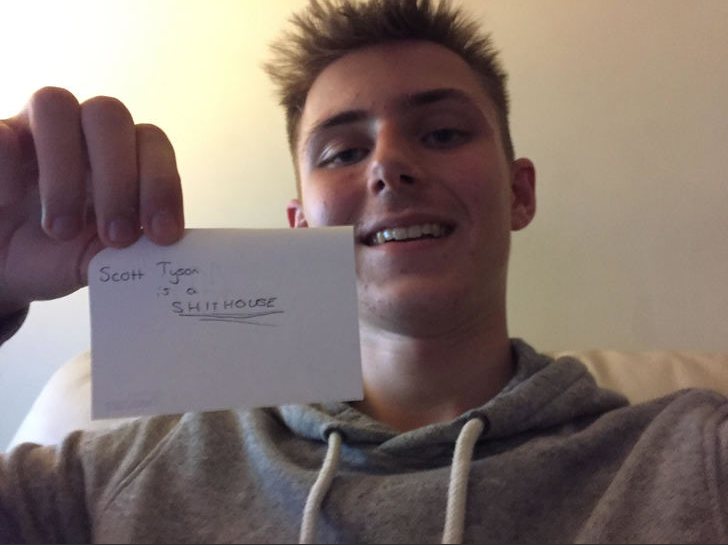 He took over with the side sat at the bottom of the Conference North and lifted them to 8th in his first season before leading them to promotion via the playoffs the following year. In 2010-11, Mellon then took Fleetwood to the Conference playoffs, losing out to AFC Wimbledon, before helping them to the title and into the Football League for the first time the following season with 103 points. After leaving Fleetwood with the Cod Army in 4th position in League Two, Mellon spent 18 months working as an assistant to David Flitcroft in the Championship at Barnsley before taking over at Shrewsbury Town at the start of the 2014-15 campaign where he guided them to promotion back into League One. 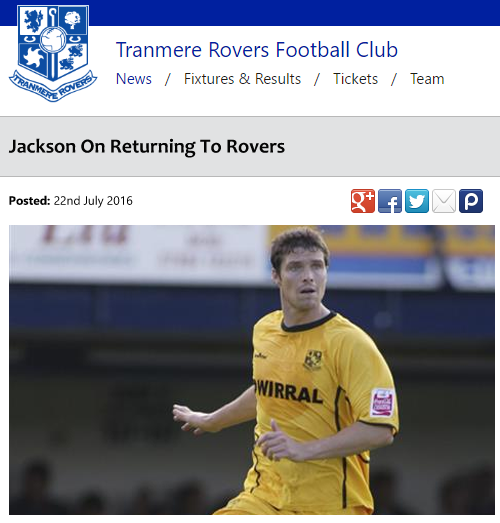 Tranmere Chairman Mark Palios said: “I am delighted to bring Micky back to Tranmere Rovers for a third time. His track record speaks for itself. He already has a number of promotions to his name and we are confident he will add to that record once more at Prenton Park. We are especially pleased to bring in a manager currently managing in League 1 and who sees the potential in the Club." Mellon, who has previously managed Fleetwood to the National League title, takes over from former manager Gary Brabin, who was sacked at the end of the 2015/16 season following Tranmere's failure to make the national league playoffs. Tranmere are a team who shouldn't be in the National League, hopefully you can get out of it. Good choice of club man and hopefully you can take Tranmere back into the EFL! The appointment of Micky Mellon as Tranmere boss has triggered an influx of staff members, with 5 former players rejoining the club. Coming with Micky from Shrewsbury are Mike Jackson and Danny Coyne, who have been named as assistant manager and goalkeeping coach respectively. Jackson made 84 appearances over 2 years at the club back in 2004 and has been Mellon's assistant since the Scot joined Shrewsbury. Coyne also had two spells at Tranmere, making over 200 appearances between the sticks at Prenton Park. Also returning to the club are former right back Robbie Stockdale and former striker Simon Haworth. Stockdale rejoins the club as a scout having previously worked at Sunderland and Haworth joins in a coaching role. Perhaps the most shocking of all is the return of former manager John Aldridge. Aldridge was manager back in the early 2000's, leading Tranmere to the Worthington cup final against Leicester at Wembley, alongside many other impressive cup runs. Aldrige rejoins the club as the new Director of Football. Micky Mellon says he is delighted to be back at Prenton Park after being announced as the Club's new manager earlier this week. Mellon had two previous spells at the Club as a player and says that affection he built during that time helped him make the decision to return to Wirral. He said: "It's great to be back at a Club that I have so much affection for. There are still a lot of familiar faces here. A lot of things have changed, but it is still a fantastic football club. The most important thing to do is to win the next game." "I never looked at this as dropping down. To come to a Club that I have such high regard for is the exciting part for me. A lot of ex-players have been contacting me all saying 'get in there and win games' because they also have so much affection for the Club. I have a great affection for the Club and I want to win games here." 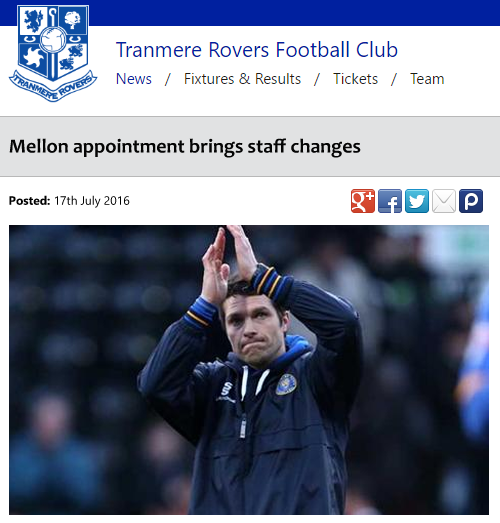 Interesting developments at Tranmere! Looking forward to seeing how results reflect the work behind the scenes! Tranmere chairman Mark Palios says he doesn’t have to set new manager Micky Mellon specific targets because the expectations of his role are obvious. Founder members of Division Three North, Tranmere finally surrendered their Football League status after 94 years in 2015 and after finishing just outside the play-offs last season, Gary Brabin, the man originally tasked with getting Rovers out of the National League was sacked last month. 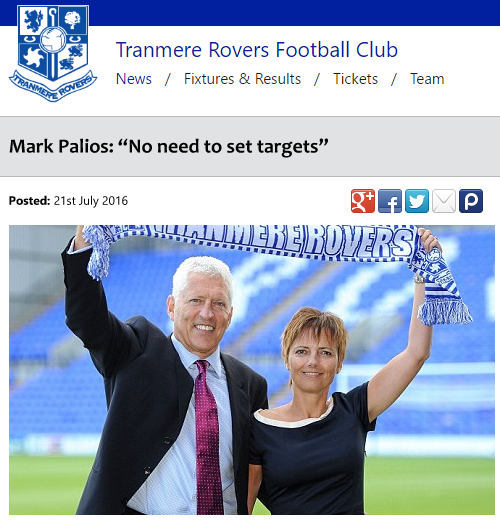 While Palios is obviously determined to win back a place in the Football League as quickly as possible, he is also building an infrastructure at Prenton Park for the club to flourish in whatever the vagaries of results on the pitch. Mike Jackson says he is delighted to be back at the Club and teaming up again with Micky Mellon in the dugout. The duo spent more than two years working together successfully at Shrewsbury Town, and Jackson says that their knowledge of the Club and passion should be useful. He told Tranmere PlayerHD: "There's no magic wand for someone to come in and just get straight to promotion, but Micky has a passion and cares about what he does and I have noticed that all the staff here are the same and really keen to do well. I think it does help with us being ex-players here. But you look around the youth set-up and the coaches are mostly former players and it's much more than just a job here. "We know the expectations, the fanbase so we know what we're coming into. You can achieve a hell of a lot through mentality alone and that can build confidence and that's something we will be working on." Jackson says that the squad can also feed off the passion of the Super White Army. Having sat and watched the Tranmere from the stands during the 2015/16 season, Jackson says the players can feed off the energy of the supporters. "I was here for the Wrexham game last season and there was a great atmosphere. Every time we got into the final third they (the fans) were up, and they're passionate supporters here and they know their football. We have to use those fans to our advantage." Portsmouth's winger Ben Tollitt has today joined Tranmere for the rest of the season on loan. Tollitt began his career at Everton but was released without making an appearance at Goodison Park. From there, he moved to Widnes where he scored 18 goals in 43 games. After a brief stint at Skelmersdale in 2014, Tollitt signed a one year deal at Fratton Park. Tollitt made his first Portsmouth appearance in an EFL cup home win against Derby County and scored his first goal in a League Two game against York in November. 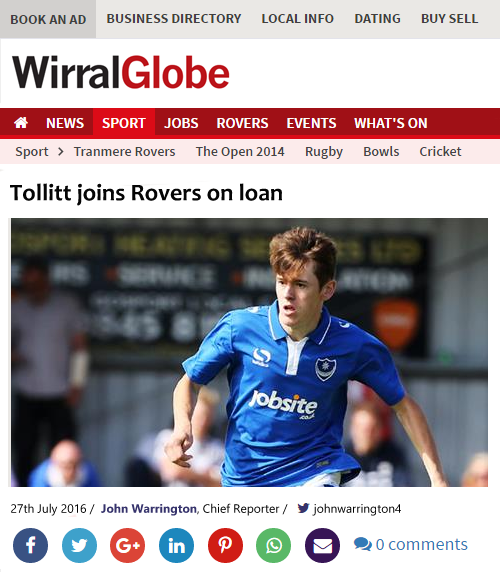 Tranmere manager Micky Mellon spoke of his delight at acquiring the services of Tollitt. "I'm delighted to have Ben here at the club. Ben is someone who has been on my radar for a while after seeing his performances for Portsmouth last season. He's a local lad having started his career at Everton and he's raring to go out and impress." Should be a good piece of business for you man! 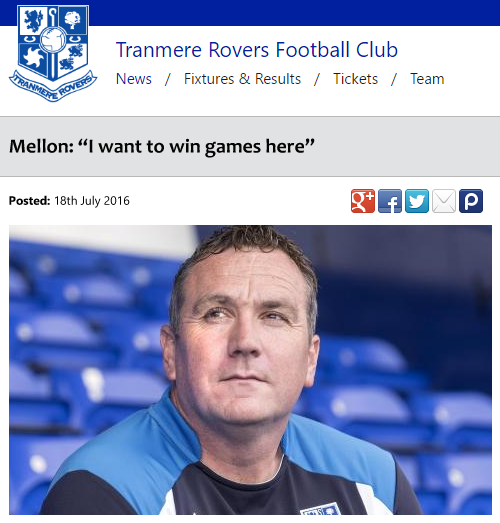 You are reading "Tranmere Rovers - Who needs a lemon when you've got a Mellon!". Handcrafted in Symi, Hellas. Page created in 0.193 seconds.